In Sekiro Shadows Die Twice, the Gourd is your main source of healing power. While you may think there is only a single Gourd in the game, you are actually incorrect there are a total of four Gourd types with different healing properties. Below I will highlight all Gourd Types in Sekiro Shadows Die Twice. The Healing Gourd is given to you by Emma at the beginning of the game. This item is used to replenish your Vitality. The Healing Gourd has the following description. This item can be upgraded a total of 10 times using Gourd Seeds. 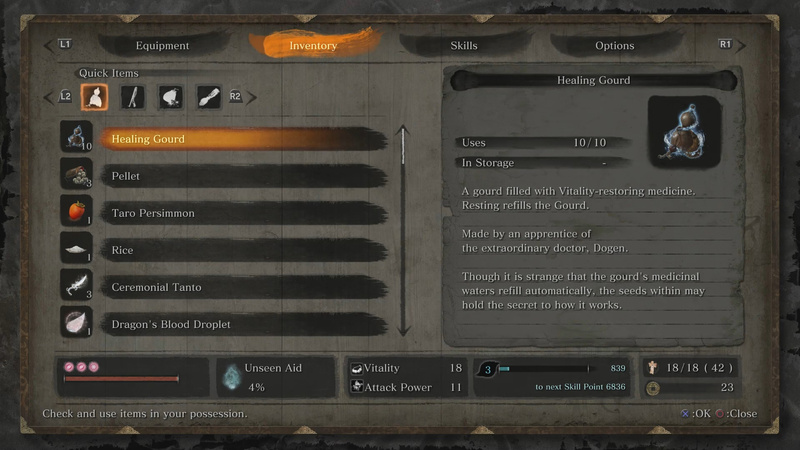 There are also two Latent Skills you can unlock which give you better healing per Healing Gourd swig. You can purchase the Withered Red Gourd from the Pot Noble merchant Harunga for 2 Treasure Carp Scales. This gourd will both decrease Burn buildup and provide better Burn protection when drunk. It has 5 uses. The Withered Red Gourd has the following description. 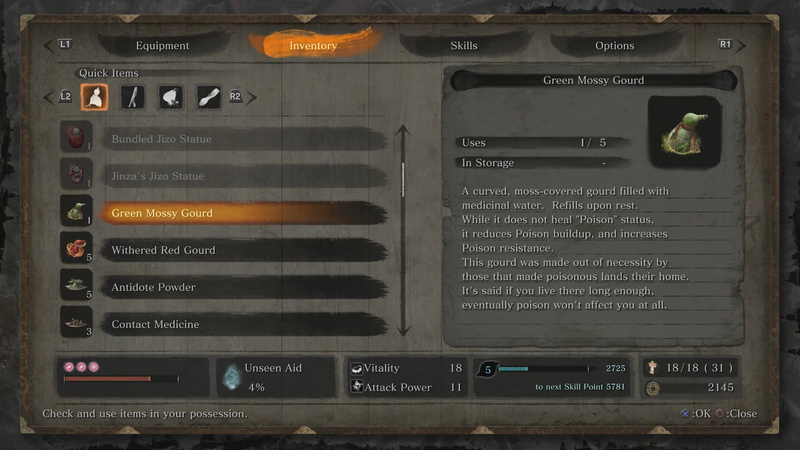 The Green Mossy Gourd can be purchased from the Toxic Memorial Mob merchant in the Sunken Valley for 1800 sen. Using this gourd will decrease Poison buildup and increase Poison resistance. It has 5 uses. The item has the following description. 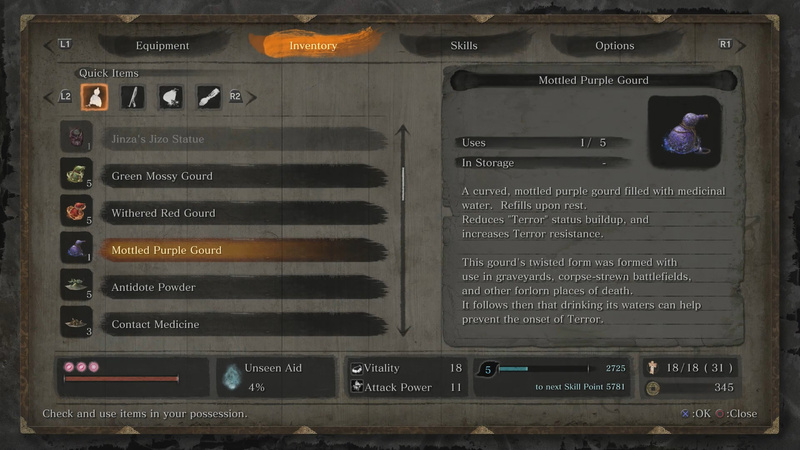 You can purchase the Mottled Purple Gourd from the Exiled Memorial Mob merchant in the Ashina Depths for 1800 sen. Using this gourd will decrease the Terror status buildup and increase Terror resistance. This gourd has 5 uses. Here’s the Mottled Purple Gourd item description. That’s all the different Gourd types you can unlock in Sekiro Shadows Die Twice. Any of the Gourds listed must haves? Let me know in the comments what you are running with. Thoughts on all Gourd types in Sekiro Shadows Die Twice? Drop them in The Pit below.